My Bobbi Brown gel eyeliner is pretty much the best product I have ever used, but finding the perfect brush to use with it is a nightmare. At the moment, I usually use my NARS Angled Eyeliner Brush but, since it's pretty big and chunky, it's difficult to get a neat, precise line and winged liner is a no-no. After trying out a huge range of different brushes, from MAC to Real Techniques, I decided to give the super-precise Laura Mercier Angled Eye Liner Brush a go. As you can see, this brush is cleverly designed so that the tip is angled upwards, making it- in theory- easier to apply eyeliner. In reality, I'm so used to traditional brushes that I've found it quite difficult to get the hang of and it hasn't really made much of a difference. I have, however, noticed that I'm less likely to smudge eyeliner on my face, so there's that! A big plus point for this brush is how small it is. Since I have all the eyesight of a particularly poorly-sighted bat, when I'm not wearing contacts, I need to position my face really close to the mirror when I apply eyeliner. Traditional brushes with long handles make this very difficult so this tiny size is a big benefit for me. It also helps that it takes up hardly any space in my make up bag, unlike my others! The bristles, which are synthetic, are gathered into a very small point. Together, they're quite firm so, when I put my eyeliner on, they don't splay and smudge the product. Instead, I'm left with a neat, even edge. However, I do find that, for some reason, this brush doesn't seem to pick up much product. It takes quite some time to build it up to opaque coverage as it tends to apply in thin streaks. 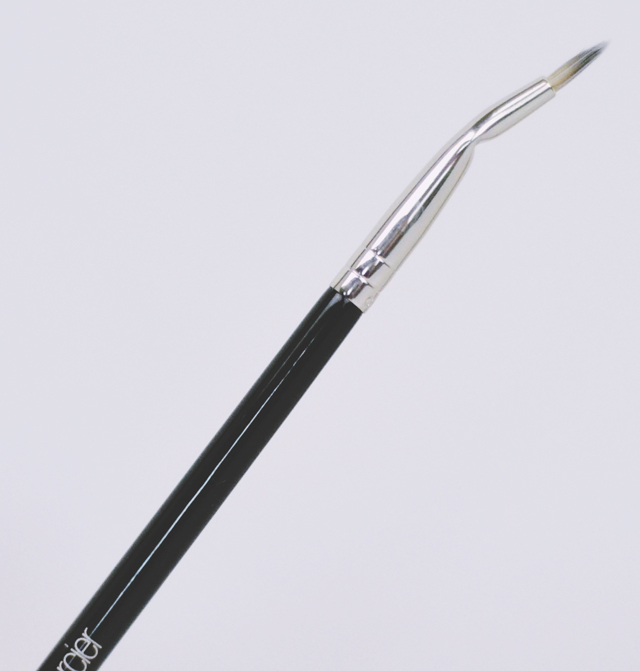 I also found that, despite the small point of the brush, it's difficult to create a precise point on winged eyeliner. I have seen other people manage it with this brush though so it's possibly just me! If you're after a small brush to create a subtle, more natural look to your eyeliner, you won't go far wrong with this one. For me, however, I need something idiot-proof that's more suited to precise, dramatic looks. I'm going to try a Bobbi Brown brush next. Surely it will be the perfect tool to use with their eyeliner! Try fine art brushes, good quality ones can be bought for around a fiver, most fancy make up brushes are way more expensive. there are so many different sizes and grades to choose from depending on what you want the finished look to be. The brushes (in my opinion are far better quality). I adore Bobbi Brown gel liner and honestly would not go back to proper make up brushes.